Favorite perfume fragrance ever. The price for this item was a steal. I am always looking for a deal on clinique because at Macy it's more than I would like to spend. I would definitely purchase from this one again. Happy customer. Lift your spirit whenever you wear the aromatic Elixir perfurme spray by Clinique. The combination of floral, fresh, and woody notes creates a noticeably stimulating fragrance. Due to the personal nature of this product we do not accept returns. Perfume size is unbelievable. Alot for the price. I could not believe the size of the bottle when I opened the package. I thought it was a mistake and almost contacted the vendor. But I checked out the info and it is right. The ONLY thing that threw me for a loop a bit is that the scent is not quite the same as the one I wore back when this scent was first launched. Bit stronger. But maybe it is my body chemistry that is OLDER. Love it. I just do not go overboard with it. One of my all time favorites for more than 30 years! I will wear this fragrance forever and a day. Clinique speaks for itself with Aromatic! Clinique Elixir is such a classy and beautiful perfume. I prefer it during the fall and winter months due to it's dry essence. It is my mom's and mother in law's favorite perfume. It has an amazing long lasting essence. 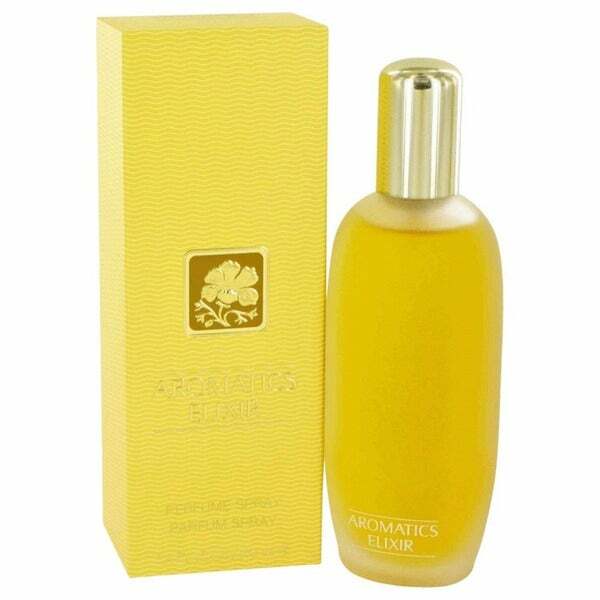 My aromatics Elixir has a awesome smell, it's unbelievable that I got the real perfume at the fraction of the cost, and to top it all it was delivered to me free 2 days after ordering it on line, that was free express delivery. Thank you. Giving as a bday present next Sunday. Waiting to find out if the product is fresh. I got it for a great price and my daughter is worried the product may be old. Hopefully it is not and I just got it at a great after Christmas price. More later, but I am staying positive! I've been wearing this fragrance for years. I was purchasing it from a "high end mall retail store" until I found out about Overstock. Now I just buy it from Overstock when I need another bottle. The 3.4 ounce perfume is so much cheaper than the "retail mall store". Thank you Overstock for another great buy! Used this scent for years. Love how it changes to a personalized perfume on each person...been stopped by all sorts of people asking what it is. LOVE IT! This is my favorite fragrance of all time, I have use this product for the pass 20 years. I receive so many complements all day every day. Wow what are you wearing. I had a friend that was so, so jealous of the complements I was receiving that she called it an old lady fragrance.. Call it what you will, but it works for me. My Husband LOVE'S IT !! This is my favorite. Can't get enough of this fragrant. Doesn't smell the same when it first came out. This is the best fragrance ever. I got at a reasonable price. I love this perfume, and can get it cheaper here. Honestly this is my signature fragrance, it goes great with my body chemistrie, l get so many complements, no matter what other kind I buy this one is the one for me! a bit heavy scent. a little goes a long way. I love this perfume!! This is one of my "go to" perfumes. I always purchase perfume online and was extremely happy to find such a good price at overstock. A wonderful fragrance at a great price. This was exactly what I was looking for for my aunt! She loves it, her favorite fragrance! It arrived quickly and in great condition.